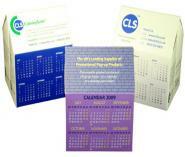 Desk calendars are a great promotional tool. 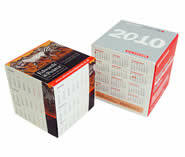 A branded desk calendar makes a perfect business gift. Order now for 2019. All our calendars are printed to your bespoke artwork design. Select a product below to find out more. 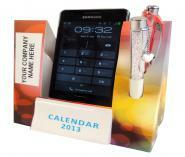 Desk calendar products are a popular choice for corporate Christmas promotions. 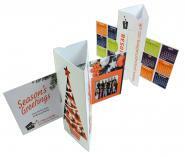 Leading up to Christmas is our busiest time of the year for custom desk calendar printing. The demand for customised pop-up calendars starts as early as August and, typically, goes right through to last minute after-thoughts! In our business communication product overview and you will find a good selection of promotional products that can convert into calendars. Of course there are some which lend themselves so well to the task of being promotional desk calendars more than others, here we have picked out our particular favourites to feature in this special section on promotional custom desk calendars. Desk calendars can be printed on a number of the products in our range however not every pop-up mailer is suitable for use as a customized desk calendar. It really depends on the shape of the product. The main considerations for a business desk calendar is that there should be enough room to print clearly visible month-by-month dates and that there is enough room for promotional print. Products with 4 or 6 sides are usually chosen and with room enough for dates these are suited to being made in to a pop up calendar. 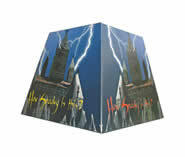 The most popular shape is the pop-up promotion calendar Cube which is ordinarily custom-printed with 3 month-by-month dates on each of 4 square panels and with promotional print on the other two panels. The pop-up cube desk calendar is a versatile product and is a popuplar choice although other popup mailer products are also suitable for printing as a business desk calendar. For example our Pop-up Ball has 12 panels for monthly dates and a hexagonal top and base for customised promotional print making it an excellent choice as a pop up desk calendar. A Pop-up House is a novel shape for a promotional desk calendar and these can be supplied with the dates positioned in different places. Some clients prefer the roof and others the walls but either way gives an effective display. 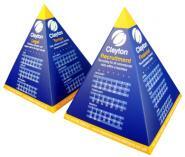 The Pop-up Pyramid is another unusual shape that has 4 triangular faces with space for the promotional message above the dates – great for use as advertising calendars. 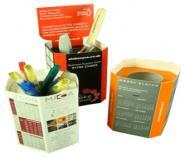 Enhance your desk calendar and offer dual use promotional business gifts. 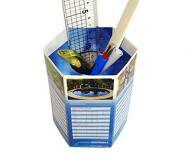 Adding pen holes to your pop up mailer product creates desktop pen holders and business desk calendars in one. Popup mailer pen holders come with 4 or 6 sides and can have an automatic pop-up action like our Pop Up Pen Pot, or there is a budget version with a manual push-up action, both are equally suited to custom desk calendar printing. The manual version of the promotional pen holder can be supplied with the added option of a header card to give clear focus to the promotional message. The Pop up Pen Holder Cube and the Pop Up Pen Holder House can also be adapted to combine desktop penholders or desktop pencil holder with calendars. The attributes of these particular business desk calendar products work together to produce a customised product that is guaranteed to give your promotion a desk life that offers fantastic value for money. 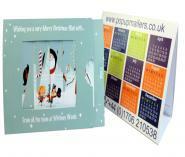 Your 12-month pop up calendars will cost something like 2p – 3p per week, truly cost effective company promotional products! 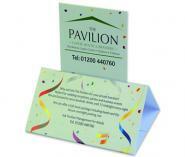 Every single item in our company promotional product range is classed as below the line advertising. Whatever your current promotions, whether it's a product launch, event promotion marketing, updated information for your clients or even a moving announcement, we have a product that can help you. A classic example of below the line advertising or marketing would be a direct marketing campaign and our products are perfect for such promotions, particularly products which can be printed as a business desk calendar or adapted to become a desktop pen holder - or both! Almost every item that has been recommended for use as a business desk calendar or pen holder comes with its own all-board mailing envelope and also has an automatic pop-up action. The mailing envelopes protect your promotional calendar or novelty pen holders in the post, ensuring that the goods arrive with your customer in perfect condition. 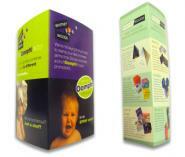 Once your customer opens the pack your pop-up product jumps out, creating instant impact and fun. This then creates customer interaction which makes the products perfect for advertising below the line. In retail and consumer advertising below the line, there is perhaps more freedom than in business to business below the line advertising. There is perhaps a narrower scope in which to create an impact and so it is, therefore, all the more important that you maximise your opportunities. If the object of sending a business desk calendar or a pen holder is to put your company, product or brand in front of your customer there is no better place to be than on the customer's desk top, and that is exactly where our pop-ups will find their new home. Not only that but the pop up calendars and pen holders including the pop up 3-in-1 phone cradle will hold that position for months making the cost of these terrific below the line advertising products somewhere in the region of 2p - 3p per week on average.